Connecting to the network becomes super easy by simply clicking the WPS button integrated into the WiFi Station software. Maximum data security via WPA and WPA2 encryption. Certified WiFi b, g by the Wi-Fi Alliance, the key guarantees maximum compatibility and optimal performance with 11n products on the market. Maximum compatibility with the WiFi N standard, data rates up to 150Mbps. 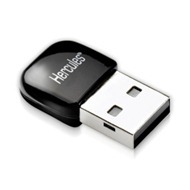 The Hercules WiFi Station software lets you manage all of the key's advanced functionalities.